The Primate Rescue Center relies on the hard work and dedication of volunteers to help ensure that our residents get the high quality care they deserve, and that our organization functions efficiently. As a volunteer, you will have the opportunity to observe primate behavior, interact with primates from a safe distance, and have the satisfaction of knowing you are improving the lives of monkeys and chimps! Our volunteers must appreciate that our residents are not pets, are not used for invasive research, are not for sale or adoption, and do not benefit from exposure to the general public. The PRC operates 365 days a year and volunteer help is welcomed year round. Our website will help familiarize you with our history and mission, and give you some sense of the vital role that volunteers play in our day-to-day operations. 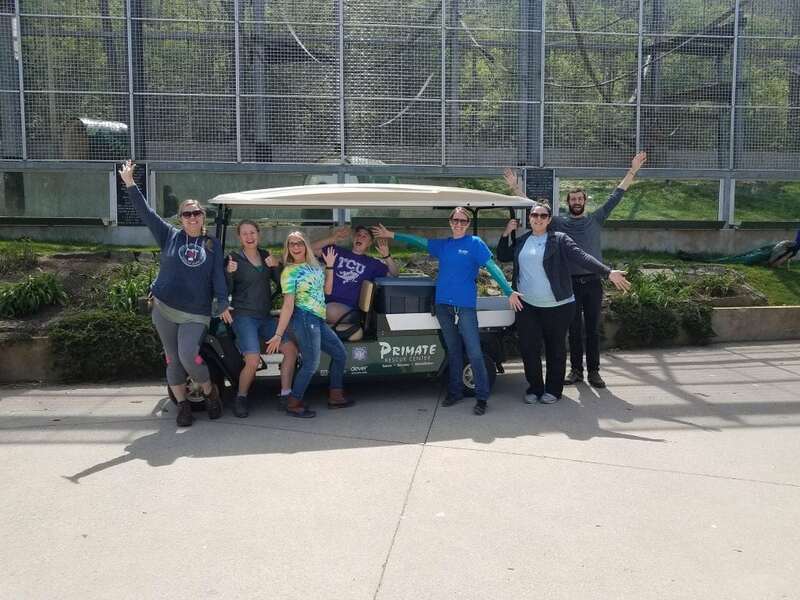 We have many different types of volunteers, so take a look to see what category best fits you as a potential volunteer at the Primate Rescue Center! Our animal care volunteers are a vital part of our daily routine at the sanctuary. Depending on your level of time commitment, as a volunteer you may have the opportunity to assist caretakers with many daily tasks such as food preparation, enrichment and cleaning. As a grounds keeping volunteer, you will have the opportunity to make the sanctuary a more beautiful place for our primate residents to live. Grounds keeping volunteers may assist our maintenance staff with planting flowers, mulching, weeding, cleaning vehicles, and general grounds clean-up. Are you… At least 18 years old? Living in the local area? Able to commit to at least 3 hours a week? Available between 9:00am – 5:00pm? Seeking a long-term volunteer commitment? Able to lift 25 pounds and engage in strenuous physical activity? Ready to get your hands dirty? Ready to work together with other volunteers, interns and staff? You may qualify for our On-Site Volunteer program! We depend on caring individuals to dedicate their time to helping us provide lifetime sanctuary to nearly 50 rescued primates, including monkeys and chimpanzees. 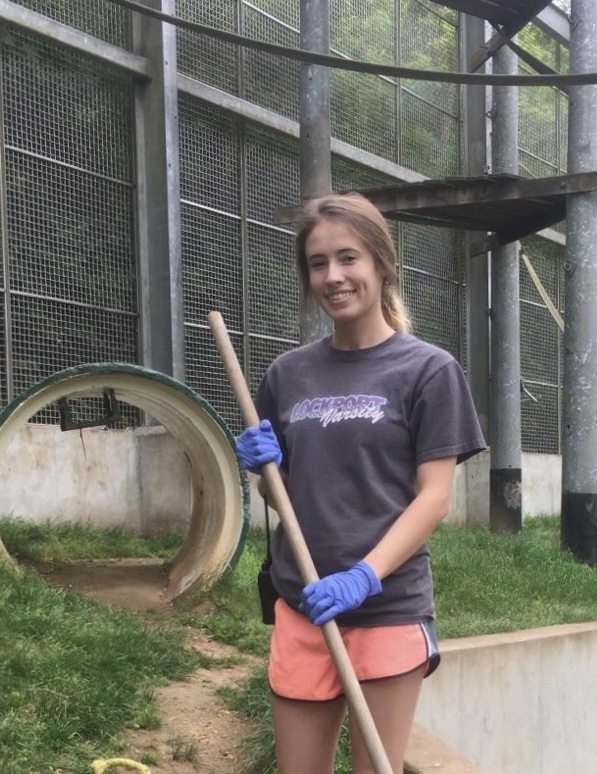 Our volunteer categories offer a variety of ways individuals can help the primates and the sanctuary, including meal preparation, enclosure maintenance and cleaning, and creating enrichment as well as other administrative and professional services. Volunteers feel rewarded and fulfilled by knowing they are making a difference in the lives of the primates who live at the PRC. Due to the nature of the species we work with and our commitment to the highest safety standards, volunteers never have any direct physical contact with any of the primates. Off-Site Volunteers are extremely important to the Primate Rescue Center. We have a great Off-Site Volunteers Packet with tasty recipes, fun enrichment ideas and exciting fund-raising challenges that you can work on from your own home! Off-site Volunteers must coordinate with the volunteer coordinator when working on any off-site project. Each Spring the PRC holds a members-only event at which volunteers are needed to assist in a multitude of tasks, such as merchandise sales, silent auction, information booth, raffle ticket sales, children’s games, face painting, registration of guests, photography and educating the public about the sanctuary and it’s residents. We depend on volunteer support to help this event run smoothly. We also hold various smaller fund-raising and educational events throughout the year. 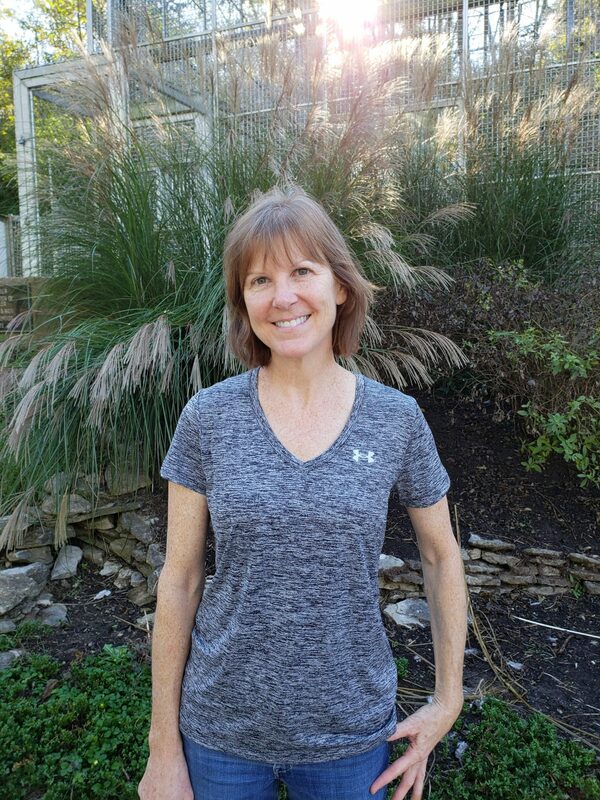 Out-of-Town Volunteers will work a 40-hour week on-site at the sanctuary and may be asked to perform the same tasks as on-site volunteers (see On-Site Volunteer section). Out-of-Town Volunteers will be totally immersed in the daily routine at the sanctuary and will have the opportunity to learn volunteer tasks quickly. The PRC welcomes the help of professionals in a number of fields to offer up their expertise. Landscapers, Arborists, Artists, Graphic Artists, Painters, Carpenters, Clerical Workers, Financial Advisors, Accountants, Journalist, Organizers, Housekeepers, etc. can all make a difference at the Primate Rescue Center by providing their skills to help us better the lives of our residents. Our volunteers have been hard at work.